Transmission released new version 2.93 already, while I still could not find the upgraded version in the SynoCommunity repository. The current 2.92 version has one issue on my system that it causes memory leak and will be killed finally by the kernel, so I have to create a job to check the memory usage and restart it automatically. I want to upgrade to this new version as 2.92 was released several years ago, and also hope to get better performance, so I decided to build the package by myself. I spent almost one night to finish this task, so I think such experience maybe could be helpful in the future or for other people, so I reinstalled the development environment just now and will redo all the steps. First, I selected the last stable Debian as the primary development system, and just installed the base packages and the SSH server. remote: Counting objects: 27294, done. Receiving objects: 100% (27294/27294), 11.19 MiB | 4.62 MiB/s, done. Resolving deltas: 100% (14423/14423), done. 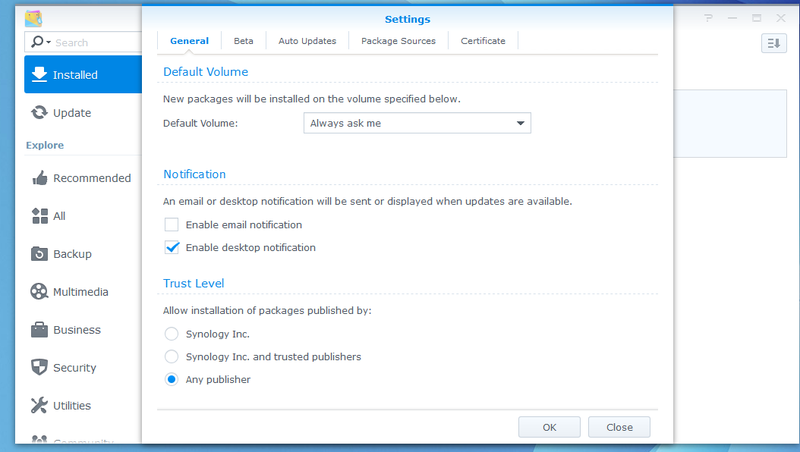 Then change the 'Trust Level' and you can install the package manually.